Matelea obliqua, climbing or oblique milkweed, is a perennial herbaceous vine native to the eastern United States. Its range includes Washington D.C., as well as parts of Maryland and Virginia, including Fairfax county. Listed as an endangered species by the state of Maryland, Matelea obliqua, is not particularly abundant in any part of its range, and it must never be removed from the wild. In Virginia it grows in habitats such as open rocky woods and barrens, in dry to mesic conditions, over calcareous or mafic rocks. Because of these very specific habitat preferences, Matelea obliqua would probably not be an easy plant to cultivate. 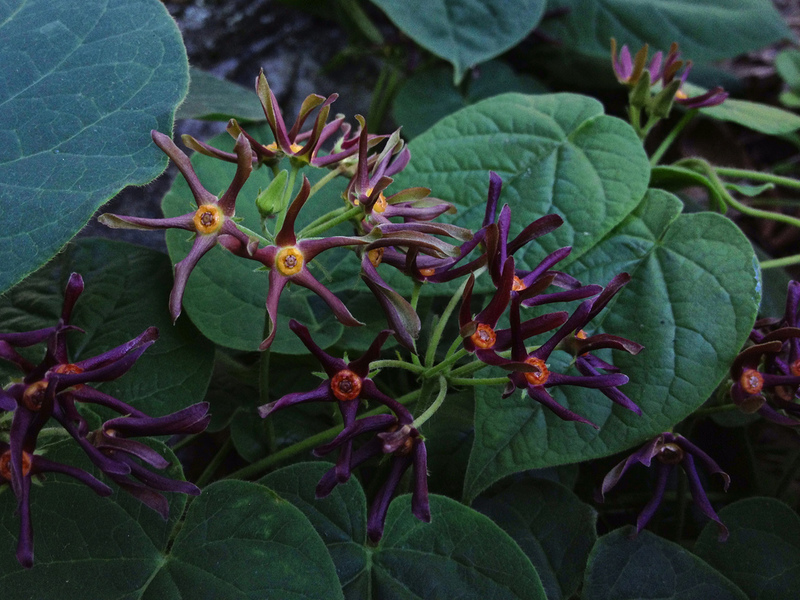 The genus Matelea, along with Asclepias, and the rest of the former family Asclepiadoideae, has now been included in the Apocynaceae family, according to the Angiosperm Phylogeny Group III system. Matelea obliqua is known to be a host plant for Euchaetes egle, the Milkweed Tussock Moth. Editor’s note: This moth is another insect which, just like the monarch butterfly, requires milkweed (Asclepias spp.) for a larval host plant. The tussock moth caterpillars often feed on older milkweed shoots. The monarch caterpillars (Danaus plexippus), prefer the younger shoots, so sharing is not a problem. Are there any programs to encourage individuals and businesses to leave open areas available for native wildflowers for bees and butterflies? I have just read your article “Matelea obliqua: Climbing Milkweed” by SUZANNE DINGWELL on June 23, 2014. I noticed you showed no record of this plant in Pittsylvania County. There are 3 or 4 growing along a roadside near my home on White Oak Mountain near Chatham. I first noticed this plant about 10 years ago. Thought you might be interested.